This is what will be available for download on December 18. At the bottom are links to where you can download it. 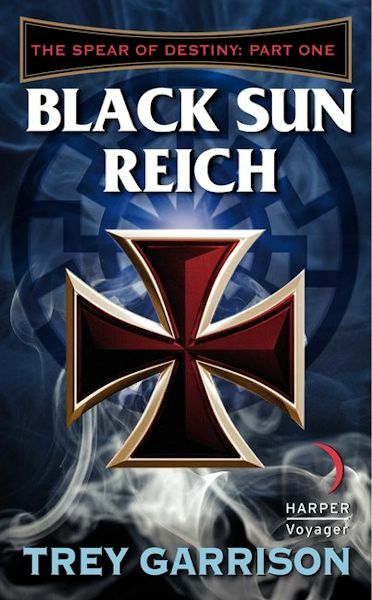 Black Sun Reich: Part One of three in The Spear of Destiny, the first novel in a new steampunk, horror, alternate history, action-adventure series set in a 1920s where the Nazis have begun their subjugation of the world using the occult, advanced science, and a holy relic with awesome powers. Trey Garrison recaptures the unapologetic adventure, wonder, and excitement of the classic pulp fiction of the 1930s and 1940s, blending elements of steampunk with deeply researched historical fiction and a good dose of humor. The novel also explores major philosophical and moral issues relevant to our contemporary world: the trade-off between security and liberty, the morality of preemptive war, and what fundamentally separates good from evil. The North American continent is made up of several rival nations, and a Cold War is building among them. The Nazis rose to power a decade ago. People travel by airship, and powerful organizations calculate with Babbage’s Difference Engine. The Nazis have hatched a plot to raise a legion of undead soldiers. Enter Sean Fox Rucker and Jesus D’Anconia Lago, two Great War veterans and freelance pilots who are pulled into the quest. They are joined by a brash Greek merchant, a brilliant Jewish cowboy, and the woman who once broke Rucker’s heart. This ragtag band of reluctant, bickering, swashbuckling heroes is soon locked in a globe-spanning race against Nazi occultists, clockwork assassins, and a darkly charismatic commando. In a world where science and the supernatural coexist, and the monsters of legend are as real as the necromancers who summon them from murky realms, our heroes alone stand before the rising shadows. But all their efforts may not be enough.